The Internet Corporation for Assigned Names and Numbers has released three additional domains under its new gTLDs Program aimed at enhancing competition and consumer choice on the Internet. 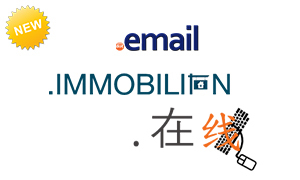 Three more new generic Top Level Domains have been approved for registration in the near future by ICANN: .EMAIL, .IMMOBILIEN (German for .REALESTATE) and .在线 (Chinese for .ONLINE). .EMAIL gets the most attention as this new gTLD because of its similarity to .MAIL, which has been regarded as a potentially troublesome new gTLD due to the risk of name collisions. The .EMAIL domain’s Sunrise period commences on 14 January 2014.